But I say to you that everyone who divorces his wife, except on the ground of sexual immorality, makes her commit adultery, and whoever marries a divorced woman commits adultery (Matthew 5:32 ESV). For from within, out of the heart of man, come evil thoughts, sexual immorality, theft, murder, adultery (Mark 7:21 ESV). But as for the Gentiles who have believed, we have sent a letter with our judgment that they should abstain from what has been sacrificed to idols, and from blood, and from what has been strangled, and from sexual immorality (Acts 21:25 ESV). Let us walk properly as in the daytime, not in orgies and drunkenness, not in sexual immorality and sensuality, not in quarreling and jealousy (Romans 13:13 ESV). It is actually reported that there is sexual immorality among you, and of a kind that is not tolerated even among pagans, for a man has his father's wife (1 Corinthians 5:1 ESV). But now I am writing to you not to associate with anyone who bears the name of brother if he is guilty of sexual immorality or greed, or is an idolater, reviler, drunkard, or swindler—not even to eat with such a one (1 Corinthians 5:11 ESV). Food is meant for the stomach and the stomach for food”—and God will destroy both one and the other. 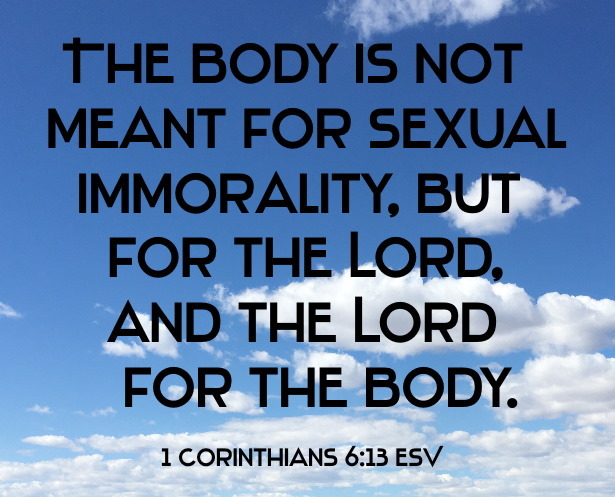 The body is not meant for sexual immorality, but for the Lord, and the Lord for the body (1 Corinthians 6:13 ESV). Flee from sexual immorality. Every other sin a person commits is outside the body, but the sexually immoral person sins against his own body (1 Corinthians 6:18 ESV). But because of the temptation to sexual immorality, each man should have his own wife and each woman her own husband (1 Corinthians 7:2 ESV). We must not indulge in sexual immorality as some of them did, and twenty-three thousand fell in a single day (1 Corinthians 10:8 ESV). I fear that when I come again my God may humble me before you, and I may have to mourn over many of those who sinned earlier and have not repented of the impurity, sexual immorality, and sensuality that they have practiced (2 Corinthians 12:21 ESV). Now the works of the flesh are evident: sexual immorality, impurity, sensuality (Galatians 5:19 ESV). But sexual immorality and all impurity or covetousness must not even be named among you, as is proper among saints (Ephesians 5:3 ESV). Put to death therefore what is earthly in you: sexual immorality, impurity, passion, evil desire, and covetousness, which is idolatry (Colossians 3:5 ESV). For this is the will of God, your sanctification: that you abstain from sexual immorality (1 Thessalonians 4:3 ESV). Just as Sodom and Gomorrah and the surrounding cities, which likewise indulged in sexual immorality and pursued unnatural desire, serve as an example by undergoing a punishment of eternal fire (Jude 1:7 ESV). From Bible Verses about Sexual Immorality to "What is Sin?"